This winter, the Worcester Art Museum (WAM) will explore a pivotal period in Japanese history, through the eyes of artist Utagawa Hiroshige (1797−1858) and his print series Famous Views of the Sixty-odd Provinces (1853-1856). 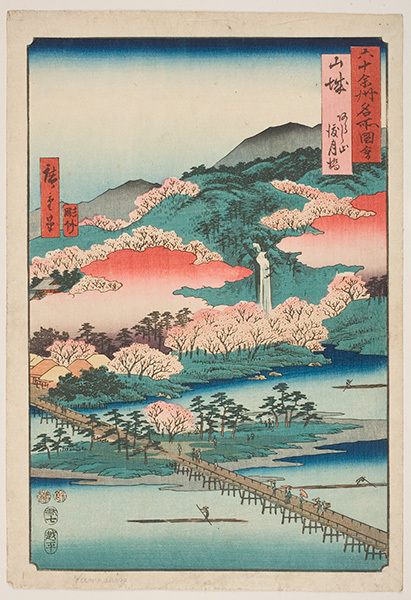 Created during a time of change—after a growing network of roads spurred an increase in tourism within Japan—Hiroshige’s 69 prints tapped into this growing fascination with the country’s landscape and captured many meisho, or famous places, long catalogued in Japan’s literary tradition. Organized by the Worcester Art Museum from the complete set of this series in its collection, Travels with Hiroshige will be on view February 23 through May 26, 2019. While Hiroshige did some sketching outdoors, for Famous Views of the Sixty-odd Provinces he referred extensively to other sources, including Japan’s centuries-old landscape painting tradition and numerous commercial travel guides that had been developed before or during his lifetime. Among those was the popular guidebook, Exceptional Mountain and Water Landscapes (1800–1802). The result was a series of works that both aspired to topographical accuracy and yet were infused with an artist’s creativity about imagined places. This sensibility—in which reality was equal to the artist’s own inspiration—is a continuation in visual form of a classical Japanese literary tradition. During the Nara period (710−794 CE), poets began linking specific thoughts or emotions with particular locations and seasons, which grew to evoke the moods of such places even if the author did not actually visit them. This tradition turned into a canon of famous places, or meisho. Hiroshige was born in Edo (present-day Tokyo) to a low-ranking samurai who served as a warden in the city’s fire brigade. He inherited his father’s firefighting position at the age of twelve, using the small stipend it provided to pursue his interest in art in his spare time. Eventually, he became a student of Utagawa Toyohiro (1773–1829), a well-established landscape artist and print designer. In 1822, Hiroshige retired from his fire warden position to earn a living as a full-time print artist, and in 1832, he traveled the major Tokaido Road between Edo and Kyoto. Upon his return, he created Fifty-Three Stations of the Tokaido, which established him as a leading landscape print artist, alongside his older rival Katsushika Hokusai (1760−1849). 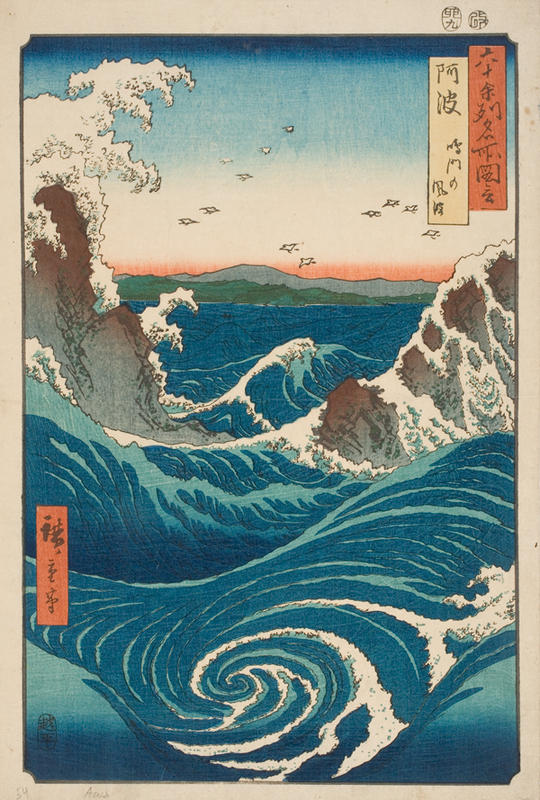 Hiroshige pioneered improvements to the printmaking process which also supported the growing popularity of the medium. By the mid-1800s, Japanese prints by Hokusai, Hiroshige, and others had captivated an international audience, most notably the French Impressionists. Claude Monet famously owned more than 200 Japanese prints, 50 of which were by Hiroshige—and eight of those prints owned by Monet are included in this exhibition. Monet’s Waterloo Bridge: Vision and Process, another WAM exhibition that coincides with Travels with Hiroshige until April 28, allows visitors to compare the artistic approaches of both landscape artists. Print connoisseurs appreciated Hiroshige’s series Famous Views of the Sixty-odd Provinces for its brilliant display of techniques, including the use of printed gradations (bokashi), overprinting, embossing, and the use of woodgrain to add texture, as seen in Mikawa Province: the Horai Temple Mountains (image on top left). He also used a newly available synthetic blue pigment for the sky and the sea, bringing in a strikingly different color. 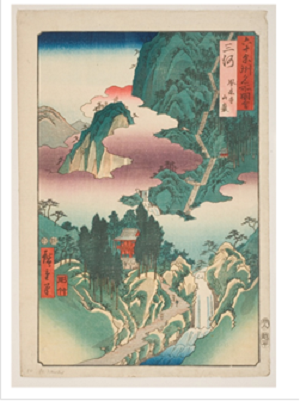 His last innovation was making his landscape prints in a vertical rather than horizontal format, a dramatic change followed by subsequent Japanese landscape print artists. With Fifty-Three Stations of the Tokaido, and then again in Famous Views of the Sixty-odd Provinces, Hiroshige added another dimension to his depictions of each landscape by drawing on the Japanese concept of meibutsu, or regional specialties. These specialties may be local handicrafts or food products—or, in Hiroshige’s time, medicinal cures, exotic creatures, and even magical souvenirs. 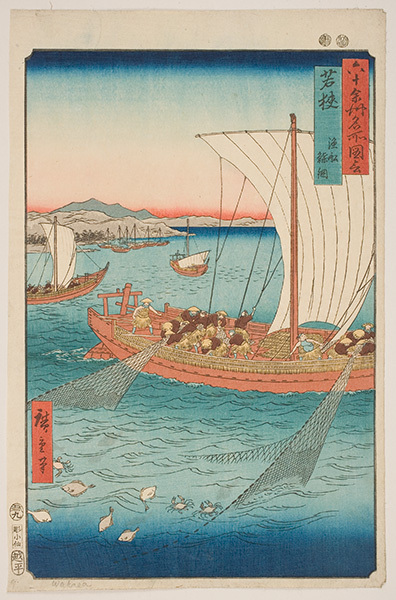 In his 69 prints—one of each of the 68 provinces and one of the capital of Edo—Hiroshige represented a number of them with views related to each province’s famous products, including several scenes of fishing and rice production, which were staples of the Japanese diet. This can be seen clearly in Tosa Province: Bonito Fishing at Sea. Independent curator Kit Brooks, PhD, gives an illustrated art talk focusing on Utagawa Hiroshige’s print Mikawa Province: the Horai Temple Mountains from the series. An accompanying reception with cash bar begins at 5:30pm. Master Series Third Thursdays are hosted by the WAM Members Council, sponsored by Abbvie, and presented with support from the Bernard and Louise Palitz Fund and the Amelia and Robert H. Haley Memorial Lecture Fund. The Worcester Art Museum creates transformative programs and exhibitions, drawing on its exceptional collection of art. Dating from 3,000 BC to the present, these works provide the foundation for a focus on audience engagement, connecting visitors of all ages and abilities with inspiring art and demonstrating its enduring relevance to daily life. Creative initiatives— including pioneering collaborative programs with local schools, fresh approaches to exhibition design and in-gallery teaching, and a long history of studio class instruction—offer opportunities for diverse audiences to experience art and learn both from and with artists. Since its founding in 1896, the Worcester Art Museum has assembled a collection of 38,000 objects: from the ancient Near East and Asia, to European and American paintings and sculptures, and continuing with works by contemporary artists from around the world. WAM has a history of making large scale acquisitions, such as its Medieval Chapter House, the Worcester Hunt Mosaic, its 15th-century Spanish ceiling, and the Flemish Last Judgment tapestry. In 2013, the Museum acquired the John Woodman Higgins Armory Collection of arms and armor, comprising two thousand objects. It continues to commission and present new works, such as 2017’s installation of the interactive Reusable Universes and Organic Concept works by Shih Chieh Huang. The Worcester Art Museum, located at 55 Salisbury Street in Worcester, MA, is open Wednesday through Sunday from 10 a.m. to 4 p.m.; and every third Thursday from 10 a.m. to 8 p.m. Admission is $16 for adults, $6 for children 4-17, $14 for seniors 65+, and $14 for college students with ID. Members and children under four are both free. Parking is free. For more information, visit worcesterart.org.